The Granada Estates neighborhood marks the beginning of home construction in Hammock Dunes, starting in 1988. Within Granada Estates, single family estate homes accommodate a variety of living preferences ranging from “year around living” to a “second home’. The overall design theme is a Mediterranean flavor and style that accentuates the colors, exterior design traits, and roof tiles of the most prestigious and traditional Mediterranean homes. All Granada Estates homes reflect a pure and simple, yet elegant sense of timelessness. Homesites average ½ acre in size with a minimum build requirement of 2,500 sq. ft.. Existing one and two-story homes range from just under 3,000 to 7,100 sq. 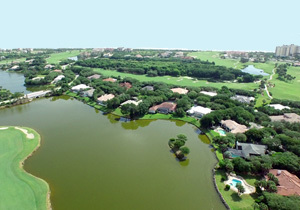 ft., with the majority of homesites situated on Golf Course Fairways or Fresh Water Lakes. The neighborhood grew at an exponential rate during the 1990s and through the early part of the new millennium, as the developer phased-in new neighborhood roads. By 1995, the neighborhood had 100 new homes, and continued to grow to 150 homes by the year 2000, with all homes owner occupied. From 2000 to 2007, the neighborhood grew to 175 homes. Even through the economic downturn, the unique appeal of the Granada Estates neighborhood added additional homes during 2008 to 2010. Since 2010, the neighborhood has experienced an acceleration in new home construction. 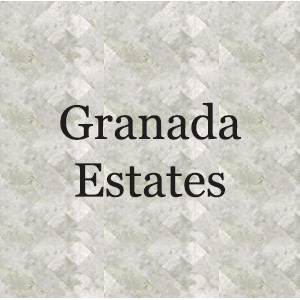 Of the 210 platted properties within the Granada Estates Neighborhood, there are only a few remaining lots available for new construction. 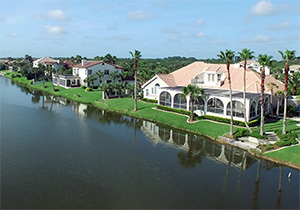 Contributing to the unique appeal of the Granada Estates neighborhood is the ownership choice of freshwater lake or golf course fairway sited lots, or lots located within protected conservation areas or on shaded oak tree lined roadways. The road structure within the neighborhood easily accommodates these alternatives. A strict design review and approval process ensures all new home construction and existing home alterations follow a design theme similar to the existing Granada Estates Mediterranean flavor and style. This design review process includes approval of both the home’s site placement on the lot and the surrounding landscape design. To ensure an estate level of separation between homes, minimum building setback lines consist of thirty (30) feet to the front home site line, twenty (20) feet from the side home site line, and twenty (20) feet from the rear homesite line. However, setback exceptions may be granted to save existing trees or in a case where a home site would be rendered not buildable due to its size, shape or topography. Granada Estates offers many advantages, other than the privacy of a single family, estate home, each with its unique one-of-a-kind landscaped lot. The pristine beach is just a short walk or bike ride away and provides opportunities to meet and greet neighbors enroute or while enjoying the breath-taking Atlantic Ocean. Individual responsibility for home and lawn maintenance allows owners to select those contractors best tailored to keeping your “estate” in like-new condition. Most important, of course, is the ability to choose an exterior design and interior layout, which defines your own personal architecture and living style.